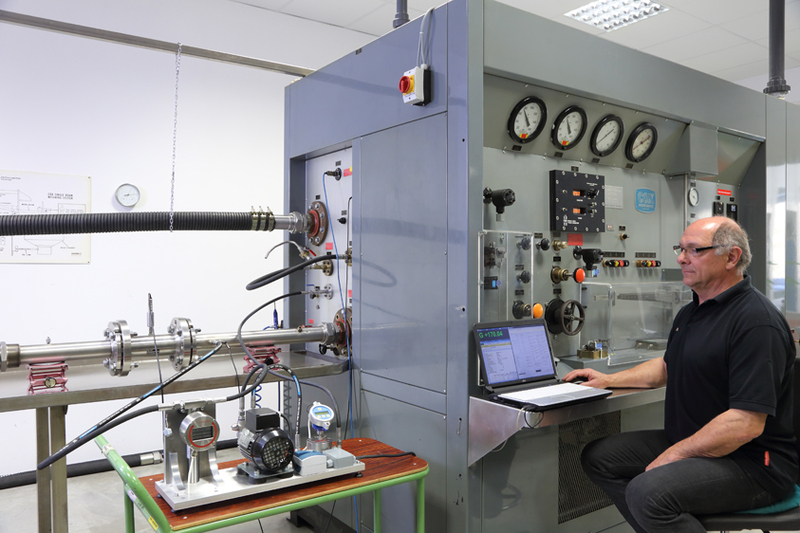 The calibration lab of KEM Küppers Elektromechnik GmbH, established in 1994 and accredited by the DAkkS according to the international standard ISO 17025 has recently the accuracy significantly improved. By implementation of a precision load cell weighting system, it was possible to cut the existing accuracy in half, down to 0.05% for mass and mass flow and 0.1% for volume and volumetric flow. The uncertainty budget was audited by the DAkkS, the notified body of Germany to approve calibration lab’s according to the ISO 17025 standard. The KEM’s DAkkS calibration rig operates with this accuracy budget on the highest global technical level in the industry. Unique is the feature that calibrations can be done with various kinds of hydrocarbons, to simulate with different densities and viscosities, even under different temperatures the operating conditions of the meter under test. A KEM calibration certificate documents not only the accuracy of the flow meter, but also guarantees the traceability of the results of the flow meter to national standards. The advantage for the customer is, that all requirements by international quality standards are met and the results of a flow meter in an industrial, aerospace, or pharma application can be trusted. With the operation principle of dynamic weighting of the calibration rig, all start/stop effects and disadvantages of volumetric calibrators are eliminated. That is especially important for Coriolis meters, PD-meters, turbine flow meters and ultrasonic flow meters as well. Even national laboratories use KEM-Flow Meters, calibrated on this unique calibration rig, for comparison of the accuracy of national laboratories worldwide. The gravimetric calibrator is located the KEM Production center for flow meter in Bad Kötzting, Bavaria, Germany. For the R&D and the design, of the high precision TRICOR Coriolis meter line was this type of calibration rig most important. Of course provides KEM the calibration service for nearly any kind of flow meters. Most of the customers of this calibration service are operating their flow meters in the aerospace industry, automotive industry, pharma-, food- and biotech industry, as well as to in the field of fuel consumption and oil and gas. When your business success relies on precision results of your flow meters of your processes, rely on the KEM’s DIN EN ISO/IEC 17025:2005 DAkkS calibration. ISO 9000, ISO TS16949, etc. More informations on www.kem-kueppers.com or at info@kem-kueppers.com.